(Clearwisdom.net) The Annual Klondike Day Parade is the grandest parade in Edmonton, the capital of Alberta Province. 2004 happens to be the 100th anniversary of the founding of Edmonton, so the Klondike Day Parade on July 22 was even more splendid. 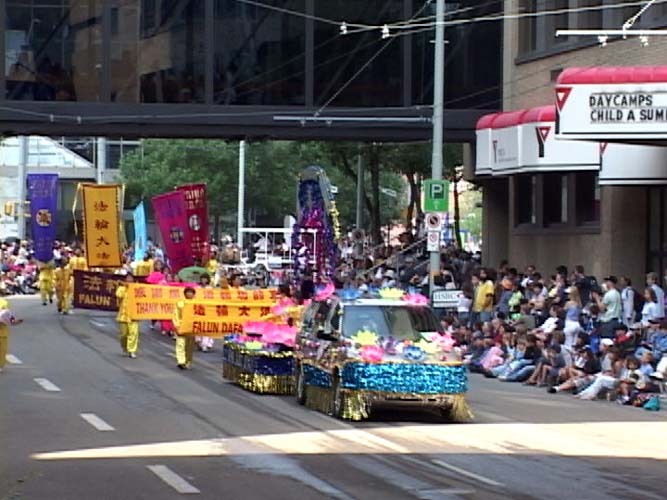 More than 110 groups participated in the parade, about 200,000 spectators watched the parade on the spot and hundreds of millions of people viewed the parade on TV. During the parade, No. 100A Falun Gong practitioners' contingent was especially eye-catching. 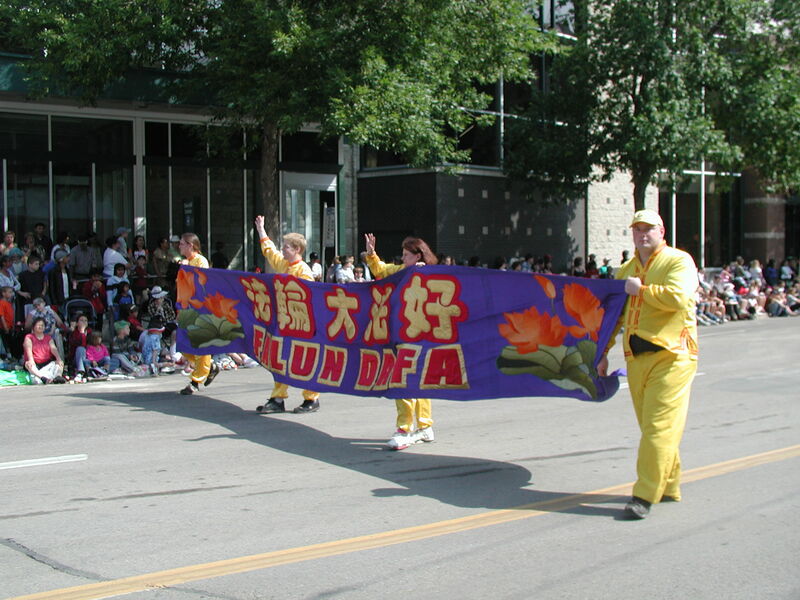 The contingent was led by a huge banner decorated with golden lotus flowers that read "Falun Dafa is Good." Behind it were four beautiful "Green Faeries" who danced gracefully while holding lotus flowers. They were the core of the contingent and led the float. 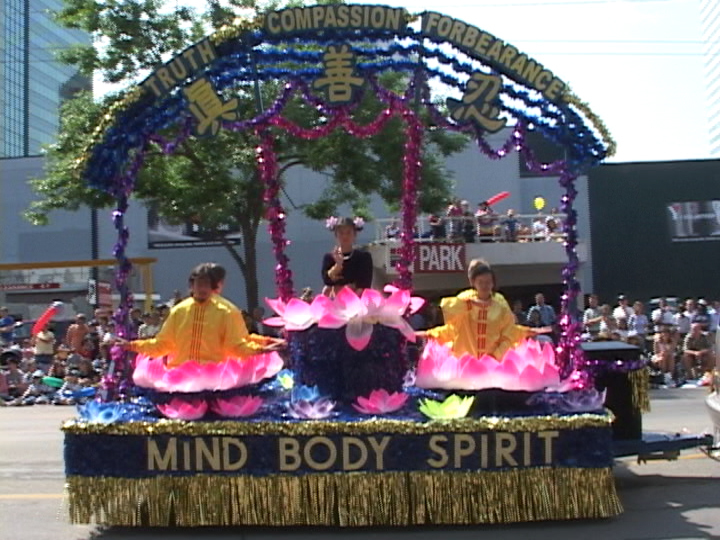 With blue as background, and gold as foreground, purple ribbons circled the float and formed the shape of "Heavenly Gate." Golden words "Truthfulness-Compassion-Tolerance" in both Chinese and English were embedded on the top of the "Heavenly Gate," implying that Falun Gong practitioners believe in the universal principle "Truthfulness-Compassion-Tolerance." On the float, lotus flowers of a variety of sizes were dotted here and there, four practitioners in golden exercise suits sat on four large lotus flowers at four corners of the float, demonstrating the exercises. Two angel like young practitioners sat on the lotus flower plates on the higher stage, constantly waved to crowds of people on the street. The shape of the float was elegant, refined and solemn, like a peaceful paradise compared with other noisy parade processions. Behind the float were six practitioners in red costumes who performed a fan dance. At the end of the contingent was a huge golden banner reading "Falun Dafa" and four banners of different colors that read "Falun Dafa --Truthfulness-Compassion-Tolerance" in English. Wherever the Falun Gong practitioners' contingent approached, people gave them warm applause. Many people shouted loudly, "Falun Dafa," "Falun Dafa is Good." 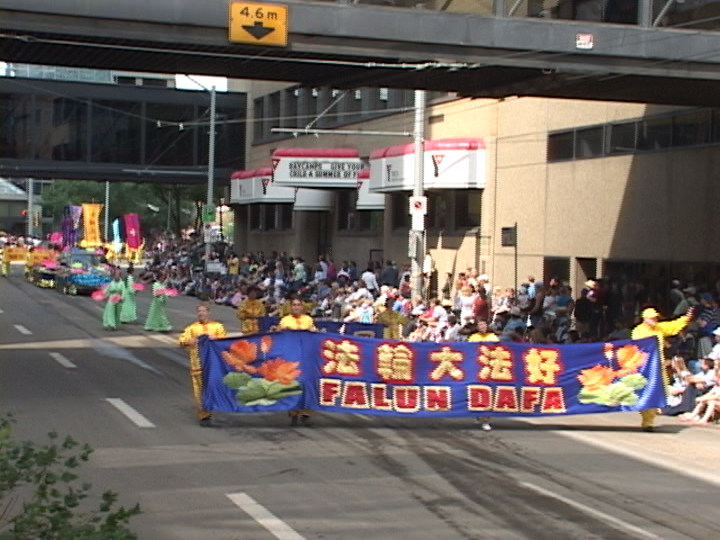 Falun Gong practitioners' parade entry entitled, "Bringing Falun Dafa's Beauty to People" achieved a great success. Nevertheless, this splendid contingent had not begun preparing until only two days before the parade began. 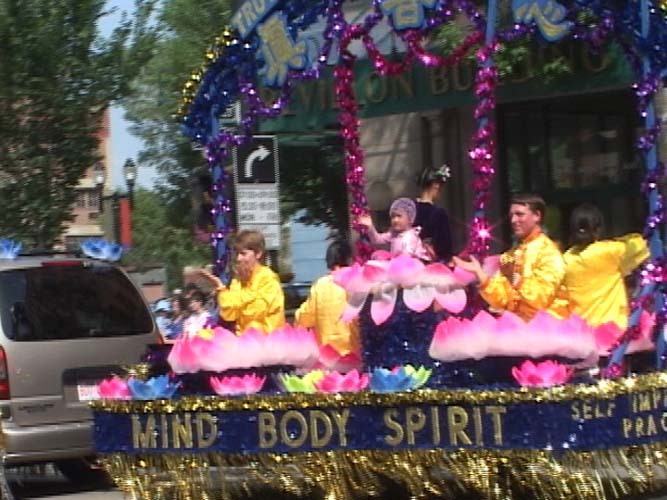 Local Falun Gong practitioners had long applied for participating in the annual parade, but the sponsor refused practitioners' participation in mid June with an excuse that the entry lacked a " recreational feature." At that time, a practitioner tried to appeal to the sponsors and clarify the truth to them, but he could not contact related staff of the sponsor. After the shooting incident in South Africa, while contacting local media to clarify the truth about Falun Gong , a journalist from the largest newspaper Edmonton Journal showed great interest in and made a report on the fact that Falun Gong practitioners' applications were refused twice in two years after participating in the 2002 Klondike Day, while Falun Gong practitioners' float won the first prize award for culture and arts at the Stampede Festival. Afterwards, local practitioners wrote a letter to editors of the newspaper regarding this report, and further made an appeal on this matter. Two local western practitioners proposed to officially appeal to the sponsor, and if the matter still could not be resolved, they would appeal to the local human rights association on the grounds of discrimination. With all Dafa practitioners' righteous thoughts, all these things were successfully done in two days. On Monday, July 19, the sponsor took the initiative to contact Falun Gong practitioners and corrected their wrong decision, but they were afraid that Falun Gong practitioners could not get everything ready in such a short period of time while other groups had prepared for a long time. With only less than two days' preparation time, practitioners resolutely decided to participate in the parade. In the following two days, practitioners made a concerted effort and not only finished preparation for the parade, but also successfully participated in the parade with a good result. 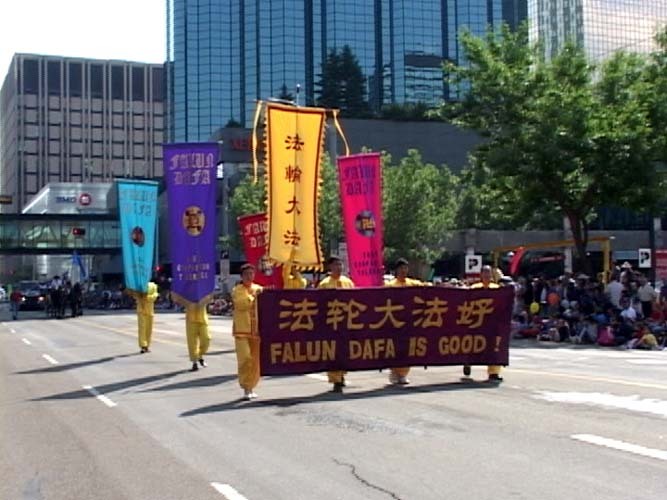 After the parade, in the Edmonton Journal's report on Klondike Day Parade, specially mentioned the Falun Gong practitioners' contingent, and highly praised Falun Gong practitioners for bringing the beauty of Falun Dafa to the citizens in Edmonton. It also said that the Falun Dafa float was so beautiful that if the sponsor hadn't changed their wrong decision at the last minute, it would be a big regret for this year's Klondike Day Parade. Practitioners were proud that their newspaper had played such a positive role in this matter.